My quilt will not be completed in time for Christmas. I was so hoping it would be. I began sewing the blocks last February for a quilting class, and am really amazed that I have gotten this far. Some months I spent hours meticulously sewing my quilt blocks; other months passed by without sewing one stitch. I wanted to have a warm, cozy quilt on my lap at Christmas time. I have spent some time in December working on the final step: quilting the backing, batting and quilt top together. My quilt blocks are coming to life. As a novice quilter, I didn’t realize how the actual quilting task would bring such rich dimensions to my quilt. It occurs to me that these stitches I am making are much like the stitches that give dimension to my life. Some seams I have chosen to rip out; the stitches went the wrong way and did not add the right kind of dimension to my quilt block. They remind me of old boyfriends and broken relationships. These stitches were difficult to rip out, painful even, and yet my life is better without them. When I pressed my foot too heavily on the presser foot of my sewing machine, the seam got away from me. It was sewn too quickly and became crooked and uneven. I decided to leave these stitches in my quilt. I hope that washing and using this quilt will soften the crooked line and make it less noticeable. Then there are the deliberate hand stitches; the invisible seams that were slowly and carefully made. They are unseen and yet add so much to the quilt. They are the love that permeates my life; the unconditional love I have for my children, the love for my family and friends, the love of my husband. The unseen Love from my Lord Jesus Christ, whose birth we are about to celebrate. Love will cover us this Christmas with its cozy warmth, bringing rich dimension to our lives. What brings dimension to your life? 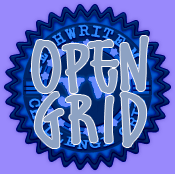 I’m joining other writers for Open Grid at Yeah Write. Go on, click the button. You know you want to. Your quilt is beautiful. I love the way you compare the stitches to life. Well told. My recent post Lockdown Drills. Great metaphor! I love your attitude and the lyrical quality to this post. Also, nice quilt! My recent post Is this a conversation or are we just yelling at each other? That's a beautiful post and a beautiful quilt. I like the comparisons. It makes me want to learn to quilt too. 🙂 Merry Christmas. Beautiful!! As others have said, the way you stitch the words and images and metaphors together is remarkable. What a beautiful quilt and such lovely words! Well done. What a beautiful post. I could see those life stitches so clearly – wonderful imagery. My recent post Oh Great, Now You’ve Done It! Beautiful; both the post and the quilt. I pray you enjoy it in good health! We choose how to write our life story just as you chose to design your quilt. Lovely. I really love the correlations you have drawn for us. This is a lovely piece. Anyone who pieces hexagons has my undying respect – knowing that everyone of them must be hand sewn together. Oh, I can't wait to see your finished quilt. It will look absolutely fantastic and you will have a great story to tell alongside the quilt. Wow, you are so talented. I just love those colors. First of all, I'm totally impressed by the quilt. I love them but know that quilting is beyond my limits. I also love how, despite having survived cancer, you sometimes forget that you're a "survivor." You've moved on with your life, even though you have the scar on your chest that reminds you every day. Maybe it's just become part of the everyday scenery, the way you hope the crooked stitches will straighten themselves out, too, and become part of the quilt's scenery. Most of all, I love how you've equated your experience with making a quilt with your life experiences. Great post Wifey! It's those variations in "stitching" that make us who we are. SO well written Ginny 🙂 I love it! The quilt looks pretty, you chose good colors. Cancer survivors amaze me all the time. You are brave. Beautiful post and beautiful quilt! I began a Christmas quilt earlier this year, too, and haven't picked it up to finish it in time for Christmas, either. However, I do have something to keep me warm and busy during the winter months. Always looking for the bright side of things! Oh your talent– the quilting and the writing. Well done. AS always.